Easily organize your wedding team. Keep track with the WeddingWire Vendor Manager. From finding to hiring, the WeddingWire Vendor Manager makes it easy to manage (and remember) all of your vendor details. Easily find and message vendors right from your WeddingWire account. Add notes and details about each vendor for later reference. Compare vendors with pricing and reviews to help you decide. Quickly reference, contact, and hire your top-choice vendors. WeddingWire became my go to for everything as I went from dreaming to realistic planning. You can mark certain vendors as "Hired"...makes them easy to find when the times comes to review your vendors. From venue tours to cake tastings, get the WeddingWire App to plan anytime, anywhere. After you set your budget, it’s time to start researching wedding vendors. From the venue and flowers, to catering and cake, there are a lot to keep track of. Our wedding Vendor Manager helps you stay organized, and keeps your stress levels down. When you research wedding vendors on our site, it’s easy to save your favorites — just click the heart icon next to the vendor’s name. You’ll be looking at photos and information from many different vendors, so our wedding Vendor Manager makes it easy to go back to the ones you love. Our wedding Vendor Manager lets you quickly reference your top picks, and message them from anywhere. In line waiting for your morning coffee? 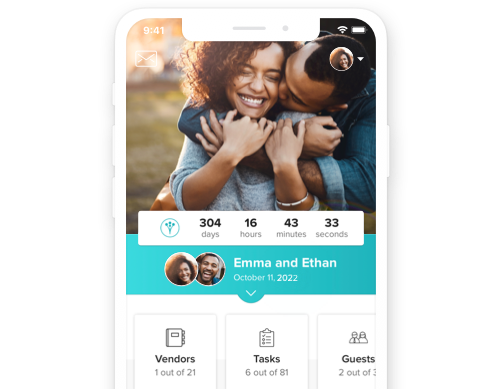 Use the WeddingWire app to reach out to any of your vendors for the first time, or reply to a vendor you’ve already contacted. It’s important that your venue and wedding planner have contact info for the vendors participating in your big day. Easily email, print or export your wedding vendor list to anyone who needs it. You’ll never have to scramble to pull the information together — everything will be in one spot!